Aquaculture production is projected to grow from 47.2 million metric tons in 2006 to 93.6 million metric tons by 2030, while wild fisheries production is expected to decline from 64.5 million metric tons to 58.2 million metric tons during that same time. 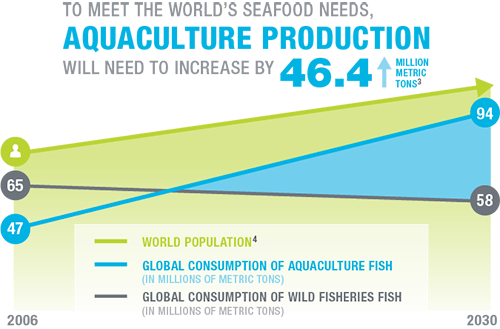 To feed the world’s growing population, aquaculture has to come up with an addition 46.4 million metric tons to meet the world’s seafood needs. Fish are more efficient at converting protein than even chickens. 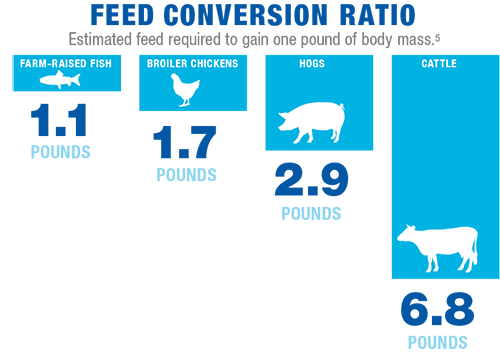 The chart below comparing the feed-conversion ratios of farmed fish, poultry, beef, etc. illustrates that aquaculture is indeed the most efficient means of producing protein. Different sources of animal protein in our diets place different demands on natural resources. One measure of this is the “feed-conversion ratio,” an estimate of the feed required to gain one pound of body mass. 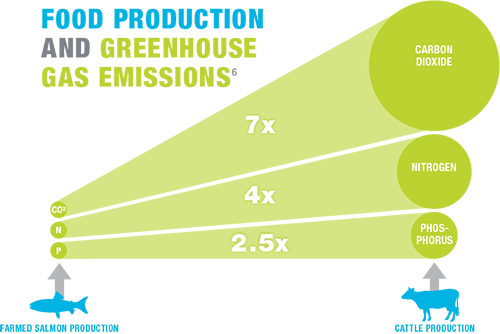 By this measure, farming salmon is about seven times more efficient than raising beef. Compare the performances of aquatic versus land-based animal protein production in terms of greenhouse gas emissions. All told, studies have found that dietary greenhouse gas emissions among meat eaters were between 46 percent and 51 percent higher than for fish eaters, 50 percent and 54 percent higher than vegetarians and 99 percent and 102 percent higher than vegans.